Bred and Owned by Ogden Mills (Dinny) Phipps. Trained by Claude R. (Shug) McGaughey. 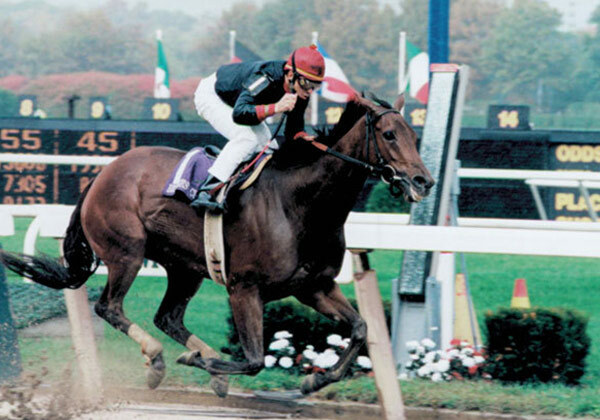 On a mud-soaked Belmont track in the 1995 Breeders’ Cup, Inside Information eclipsed the stakes-record time and doubled the record winning margin for the $1 million Distaff-G1. Her retirement was already announced, so it was only fitting that the skies should clear and a rainbow appear as Inside Information arrived with breeder-owner Ogden Mills (Dinny) Phipps and trainer Claude (Shug) McGaughey to receive a fond farewell from her fans. This was the Phipps family’s second trip to that Breeders’ Cup winner’s circle (and second stakes record), after Ogden Phipps’ My Flag won the Juvenile Fillies-G1 earlier on the card. The highest distinction an American Thoroughbred can receive is inclusion in the National Museum of Racing Hall of Fame. For Inside Information, that recognition came from voters in 2008. The compact bay filly won 14 of 17 career starts (nine stakes – six Grade 1), never finished worse than third, and defeated the best females of her era, including champion Sky Beauty, future fellow Hall of Famer Serena’s Song, and the very talented Lakeway. Inside Information’s sire and grandsire, respectively, were Claiborne stallions Private Account and Damascus. She was foaled at Claiborne on May 23, 1991, and arrived in the same crop as Ogden Phipps’ Champion 3-year-old Filly Heavenly Prize. She was voted Eclipse Champion in 1995 – the same year as Claiborne-raised Thunder Gulch was top 3-year-old Colt. Ten years later, her daughter Smuggler, raised at Claiborne and sired by farm stallion Unbridled, won Eclipse honors as America’s Champion 3-year-old Filly. Inside Information’s year-older, half-sister by Mr. Prospector is Grade 1 winner Educated Risk, dam of Claiborne-raised and Phipps-owned 2009 stakes winner Consequence. Owner Phipps commented after Inside Information’s spectacular Distaff win, “My grandmother and grandfather were deeply involved in racing, as is my father, and now my father has seen fit to let me own a piece of this stable, and all my children own a piece of this stable. So, I hope it’s going to go a long way from here.” Inside Information, Educated Risk and their descendants are the fulfillment of that hope and shining examples of the successful collaboration between the Phipps and Hancock families.